Amyotrophic lateral sclerosis (ALS) is a motor neuron (MN) disease characterized by the loss of MNs in the central nervous system. As MNs die, patients progressively lose their ability to control voluntary movements, become paralyzed and eventually die from respiratory/deglutition failure. Despite the selective MN death in ALS, there is growing evidence that malfunctional astrocytes play a crucial role in disease progression. Thus, transplantation of healthy astrocytes may compensate for the diseased astrocytes. We developed a good manufacturing practice-grade protocol for generation of astrocytes from human embryonic stem cells (hESCs). The first stage of our protocol is derivation of astrocyte progenitor cells (APCs) from hESCs. These APCs can be expanded in large quantities and stored frozen as cell banks. Further differentiation of the APCs yields an enriched population of astrocytes with more than 90% GFAP expression (hES-AS). hES-AS were injected intrathecally into hSOD1G93A transgenic mice and rats to evaluate their therapeutic potential. The safety and biodistribution of hES-AS were evaluated in a 9-month study conducted in immunodeficient NSG mice under good laboratory practice conditions. In vitro, hES-AS possess the activities of functional healthy astrocytes, including glutamate uptake, promotion of axon outgrowth and protection of MNs from oxidative stress. A secretome analysis shows that these hES-AS also secrete several inhibitors of metalloproteases as well as a variety of neuroprotective factors (e.g. TIMP-1, TIMP-2, OPN, MIF and Midkine). Intrathecal injections of the hES-AS into transgenic hSOD1G93A mice and rats significantly delayed disease onset and improved motor performance compared to sham-injected animals. A safety study in immunodeficient mice showed that intrathecal transplantation of hES-AS is safe. Transplanted hES-AS attached to the meninges along the neuroaxis and survived for the entire duration of the study without formation of tumors or teratomas. Cell-injected mice gained similar body weight to the sham-injected group and did not exhibit clinical signs that could be related to the treatment. No differences from the vehicle control were observed in hematological parameters or blood chemistry. Our findings demonstrate the safety and potential therapeutic benefits of intrathecal injection of hES-AS for the treatment of ALS. Amyotrophic lateral sclerosis (ALS) is an adult-onset disease characterized by the loss of both upper and lower motor neurons (MNs). Symptoms include progressive paralysis of MN target muscles. The disease is incurable, and fatal within 3–5 years of first symptoms, due to respiratory failure when the diaphragm is affected . About 10–15% of cases of ALS are familial, and the other cases are sporadic. Familial ALS includes mutations in Cu2+/Zn2+ superoxide dismutase-1 (SOD1)  and in RNA/DNA binding proteins FUS and TAR DNA binding protein-43 . However, the most frequent genetic cause of ALS (40% of familial ALS) is an amplification of a hexanucleotide in a noncoding region of the C9orf72 gene . The pathological mechanisms for ALS are still not well understood and the proposed mechanisms include inflammation, oxidative stress, glutamate cytotoxicity and protein aggregation. Although MNs are the main affected cells in the disease, a growing body of evidence suggests the involvement of astrocytes in the pathology of ALS in a non cell autonomous pathway. The contribution of astrocytes to the pathology of ALS is probably a combination of loss of homeostatic functions and/or gain of toxic functions. Several mechanisms by which ALS patients’ astrocytes affect ALS pathology include astrocyte toxicity; astrocytes that were isolated from sporadic and familial postmortem ALS patients and astrocytes derived from iPSCs of ALS patients have been shown to be toxic to healthy (WT) MNs [5, 6]. Similar results were obtained by primary astrocytes isolated from the hSOD1G93A mouse model with both WT and MNs derived from ALS [7, 8]. The toxic effect of astrocytes on MNs was also demonstrated by addition of astrocyte condition medium [9, 10]. This lead to the notion that astrocytes of ALS patients secrete toxic/mutated proteins that cause specific death of MNs. This hypothesis is also supported by in-vivo studies in the hSOD1G93A high copy number ALS models [11–14]. Another proposed mechanism is the reduction of functional astrocytic glutamate uptake suggested to contribute to glutamate excitotoxicity found in ALS patients . GLT-1, a glutamate transporter (aka EAAT2), was found impaired in ALS patients [16, 17]. In-vivo studies have demonstrated that focal loss of GLT-1 in the ventral horn of the spinal cord precedes disease onset in a transgenic rat model for ALS overexpressing SOD1 . Transplantation of SOD1(G93A) glial-restricted precursor cells–glial progenitors that are capable of differentiating into astrocytes in the cervical spinal cord of WT rats induced host MN ubiquitination and death, forelimb motor and respiratory dysfunction, and reactive astrocytosis and reduced GLT-1 transporter expression in WT animals . Inflammation-mediated neuronal injury is also recognized as a major factor to promote ALS disease progression and amplifies MN death-inducing processes. The neuroimmune activation is not only a physiological reaction to cell-autonomous death, but also an active component of non-autonomous cell death. Astrocytes participate in the cellular response to damage and danger signals by releasing inflammation-related molecules like NO, IL-6, INF-γ, Prostaglandin D2, TGF-β and TNF-α that can induce the apoptosis of neurons observed in ALS disease [19–23]. In both physiological and pathological conditions, astrocytes secrete a wide range of factors with multiple influences on their cellular neighbors. In addition, disruption of the astrocytic TNFR1–GDNF axis accelerates MN degeneration and disease progression, as the levels of the protective agents for MNs, glial-derived neurotrophic factor (GDNF), are reduced . Astrocytes in the ALS rat model acquire an accelerated senescent phenotype that shows reduced support in MNs, that can be partially reversed by GDNF . Another factor that plays a role in ALS pathology is vascular endothelial growth factor (VEGF), originally described as a factor with a regulatory role in vascular growth and development but it also directly affects neuronal cells [26, 27]. Transgenic mice expressing reduced levels of VEGF develop late-onset MN pathology, similar to that of ALS [28, 29]. VEGF is secreted by astrocytes and has been shown to protect MNs from excitotoxic death, as occurs in ALS . In line with these results, low levels of VEGF and GDNF were reported in the cerebrospinal fluid (CSF) of ALS patients . Other mechanisms include activation of necroptosis  and mitochondrial alterations [33–37]. These observations led to the rationale that ALS could be treated by implantation of normal wild-type healthy astrocytes from an external source, to support or replace dysfunctional ALS astrocytes . In the present work, we have used human embryonic stem cells (hESCs) as a source for large-scale production of astrocyte progenitor cells (APCs), which can be stored as frozen banks. These APCs can be further expanded and differentiated into an enriched population of young committed astrocytes by removal of the growth factors for 7 days (hES-AS), which demonstrate functional properties of “healthy” astrocytes in vitro. These properties include: uptake of glutamate; production and secretion of a wide diversity of neuroprotective factors, as seen by secretome analysis; promotion of axonal outgrowth; and protection of MNs from oxidative stress. In animal ALS models (high-copy number hSOD1G93A transgenic mice and rats), we show that intrathecal injection of hES-AS into the CSF of hSOD1G93A mice and rats had significant effects on delaying disease onset, maintaining motor performances and delayed death. To obtain safety data that are relevant to both hES-AS and to their proposed clinical use, we conducted long-term safety and toxicology studies in NSG immune-deficient mice. These studies were designed to address key safety aspects associated with direct administration of hES-AS into the CSF by intrathecal injection, including toxicity, biodistribution, long-term engraftment and formation of tumors. 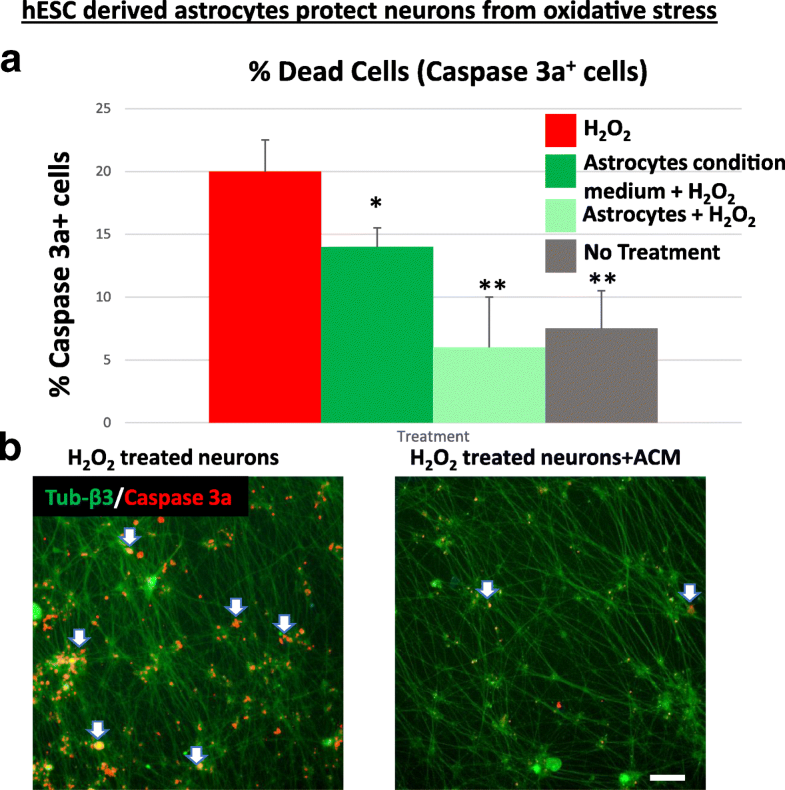 Two hESC lines (HADC100 and NCL-14) were used to produce astrocytes for engraftment in hSOD1G93A ALS animal models. Both hESC lines had a normal karyotype, expressed pluripotency markers and were capable of differentiating into all three embryonic germ layers [39, 40]. We modified our previously reported protocol  to generate an enriched population of APCs from hESCs, followed by further differentiation of the APCs into functional astrocytes (Fig. 1a). The protocol was optimized to include good medical practice (GMP)-grade materials and factors to be compatible for clinical use. In brief, hESC cultures having at least 70% of pluripotent stem cells expressing the SSEA4, TRA-1-60 and EPCAM markers were used as a starting material. The hESCs were detached and cultured in suspension with stepwise changes in media composition (Fig. 1a, b). First, all-trans retinoic acid and EGF were added for 7 days. This elicited increased production of bone morphogenetic factors (i.e. BMP4, BMP6, BMP2, BMP7 and BMP11), which were found to be essential for obtaining glial restricted cells, particularly astrocyte lineage cells [41, 42]. The suspension culture was continued with EGF resulting in the formation of neurospheres, which were seeded in 2D culture on laminin. The cells were expanded by successive passages in the presence of growth factors (bFGF and EGF) and human serum with the doubling time being 21 ± 2.6 h. This produced APCs that can be stored as frozen cell banks. The APC karyotype was tested at different passages (up to passage 12) and was found normal (Fig.1c). Flow cytometry analysis of APCs showed that the levels of pluripotent markers, SSEA-4, EPCAM and Tra-1-60, were < 0.2% (Fig. 1e). Above 90% of APCs were positive for the astrocytic marker CD44  (Fig. 1d). The APCs had additional astrocytic markers such as the Glutamate Aspartate Transporter (GLAST, aka Excitatory Amino Acid Transporter 1 (EAAT1)) , glial fibrillary acidic protein (GFAP)  and Aquaporin-4 (AQP-4) , as well as neuroepithelial stem cell markers Nestin, A2B5 and CXCR-4 (Fig. 1d). The frozen/thawed APCs were further expanded for 2–3 weeks and then differentiated toward committed astrocytes, by removing growth factors EGF and bFGF as well as human serum from the media and adding vitamin C. After 7 days without growth factors (7-day astrocytes, hES-AS), flow cytometry showed that the percentages of GLAST, GFAP and AQP-4 astrocytic markers were increased compared to APCs (Fig. 1d). Upon differentiation of APCs toward committed young astrocytes there were no remaining undifferentiated cells, as shown by the levels of TRA-1-60, SSEA-4 and EPCAM, which remained < 0.1% (Fig. 1e), indicating high purity and low risk of teratoma formation . It is important to note that only few Ki-67-positive cells were observed in hES-AS cultures (Fig. 1f), indicating that most hES-AS are post mitotic. The glutamate uptake capacity of hES-AS was tested by incubating the cells in medium containing 0.5 mM glutamate and measuring the remaining concentration of the neurotransmitter at different times up to 120 min. Astrocytes from human spinal cord served as positive control and medium without cells as negative control. As shown in Fig. 2a, the hES-AS take up glutamate from the medium occurred in a time-dependent manner similar to the control human spinal cord astrocytes. After 2 h, more than 85% of the glutamate was removed from the culture media. To investigate whether GLT-1 (EAAT2) participates in the glutamate uptake, the same experiment was done in the presence of either WAY-213,613 (1 μM) or dihydrokainic acid (DHK, 500 μM) . With either of these GLT-1 inhibitors (Fig. 2b) the removal of glutamate in 60 min was inhibited by 60% (from 64.1% removal in the control to 25% with the inhibitors), demonstrating that a significant part of the glutamate uptake can be attributed to GLT-1 activity in the hES-AS. Cultures of mouse spinal cord MNs were challenged with 150 μM hydrogen peroxide (H2O2). The number of apoptotic MNs was measured after staining for activated caspase-3 and the total number of MNs being measured by staining for tubulin-β3. Using high-content image screening analysis, we calculated the percentage of apoptotic MNs (seen as yellow cells, Fig. 3b, left panel). The results (Fig. 3a) indicate a significant decrease (p < 0.05) in MN death by adding conditioned medium from the hES-AS, as seen by the decrease in caspase-3-positive cells (Fig. 3b, right panel). When the hES-AS were added in coculture with the MNs, there was a greater decrease in apoptosis resulting from oxidative stress (Fig. 3a, p < 0.01) to levels similar to spontaneous apoptosis. These results demonstrate the neuroprotective effects by hES-AS in vitro. We next assessed the ability of hES-AS to induce axonal outgrowth in vitro. Rat primary cortical neurons derived from day 18 embryos were precultured for 2 days in Neurobasal medium (with B27) and then further cultured for 4 more days in either medium alone or supplemented with 10 ng/ml Neurotrophin-3 (NT-3, as positive control), or cocultured with hES-AS (1–2 × 104 cells), or cocultured with hES-AS conditioned medium (collected from days 5 to 7 of astrocyte differentiation). The cultures were labeled by ICF with antibodies against axonal neurofilament-160 and GFAP markers. Representative images of the five conditions are shown in Fig. 4a. 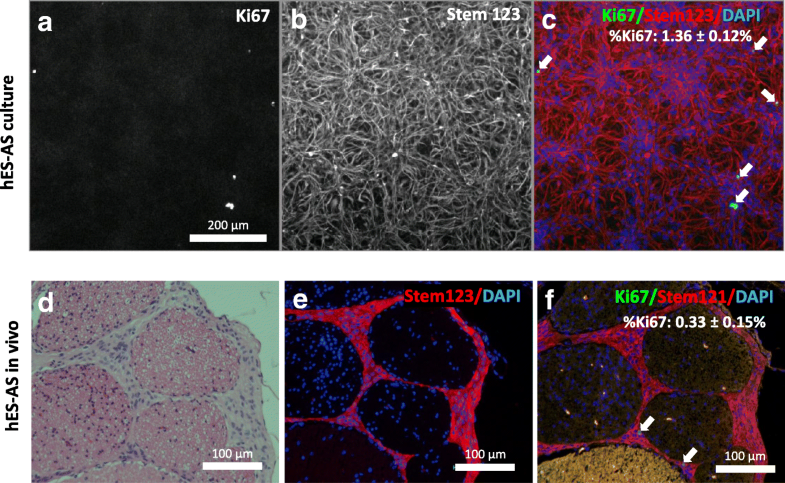 By high-content image screening analysis, the total area of axons and neurites in the NF160-stained images was determined. A significant increase in axonal outgrowth was seen in the neurons cocultured with hES-AS (Fig. 4b, p < 0.01). Moreover, addition of the hES-AS conditioned medium was found to stimulate axonal outgrowth to a similar extent as compared to the cocultures, indicating that this neurogenic activity can be attributed to factors secreted by these astrocytes. As expected, GFAP-positive cells were observed only in the cocultures, indicating that the rat cortical neurons were not contaminated by rat astrocytes. We first measured the levels of known neurotrophic factors GDNF, BDNF, VEGF and IGF-I both in hES-AS culture supernatant media and in cell extracts (cell content). VEGF was found to be secreted from hES-AS that were differentiated without growth factors for 28 days (Additional file 1: Figure S1). IGF-1 was also secreted, whereas GDNF and BDNF were found inside the cells but less was secreted (Additional file 1: Figure S1). The levels of these classical neurotrophic factors were in the range found in human CSF [49, 50]. To have a more comprehensive view of the factors secreted by 7-day and 28-day differentiated hES-AS, we carried out secretome analysis. The 48-h conditioned medium of replica cultures of hES-AS were analyzed using the human Quantibody Kiloplex Array (RayBiotech), capable of detecting 1000 proteins. A total of 220 protein factors were found to be secreted at levels over the threshold in 7-day hES-AS, about 25% of which being more abundant at 28 days (see Additional file 2: Table S1). Among the highest 120, there were 25 proteins with activities in neurogenesis, axon or neurite outgrowth or axon guidance. Interestingly, there were 13 proteins with antiprotease activity. In addition, there were extracellular matrix (ECM) components, cell adhesion membrane proteins and a few peptidases. This indicates that there is a complex set of factors secreted by the hES-AS, beyond the classical neurotrophic factors. Many of these factors may be responsible for the neurogenic and neuroprotective activities observed earlier. Examples of the secreted factors with effects on neurons or with antiprotease activity are presented in Table 1. Several of these factors may be relevant for potential therapeutic mechanism of action in ALS (e.g. Osteopontin, tissue inhibitor of metalloproteinase (TIMP)-1 and TIMP-2, Midkine, MIF; see Discussion). Both SOD1G93A mouse and rat models present a typical pattern of ALS disease progression, in which onset of the disease in hindlimbs precedes that in forelimbs, and in which the end stage results from compromised respiratory function [18, 51]. A dose of 2 × 106 hES-AS (differentiated for 7 days) were injected into the CSF of hSOD1G93A mice through the cisterna magna (CM), either once on day 67 ± 2 after birth or twice on days 67 ± 2 and 97 ± 2 (Additional file 3: Figure S2). Disease onset was determined by the loss of 3% of maximal body weight. Results demonstrate that double transplantation of the hES-AS significantly delayed disease onset compared to sham-injected controls (Additional file 3: Figure S2A; median 119 days vs 112 days; p = 0.0012, log-rank), and was better than with a single injection. Motor performance, as measured by Rotarod test as well as by neurological scoring, was significantly improved in mice that were injected twice with hES-AS, compared to sham-injected mice (Additional file 3: Figure S2D, E; p < 0.05). Two injections were better than a single dose. The survival of mice injected twice with hES-AS was somewhat prolonged compared to sham-injected mice (Additional file 3: Figure S2B; median survival 130 days vs 126.5 days; but p = 0.1, log-rank). With the double injection there was also a trend for longer survival at late times, compared to one injection. We then shifted to the rat hSOD1G93A ALS model, which allows use of intrathecal injection by lumbar puncture (LP), a route of administration similar to what could be applied in human patients. The rat model also allowed administration of more cells. A total of 6 × 106 hES-AS (differentiated for 7 days) was administered divided into two injections, the first on day 50 ± 2 after birth and the second on day 70 ± 2. A control group was sham-injected with the vehicle solution. The LP injections were in the subarachnoid space between L5 and L6 vertebra. The median survival of the hES-AS-treated rats was 216 days compared to 182 days in the sham-injected rats (Fig. 5a); Kaplan–Meier analysis for the entire experiment showed an increased survival trend (p = 0.077 by area under the curve (AUC) analysis). The disease onset was delayed very significantly by hES-AS treatment (Fig. 5b, p = 0.0001); Kaplan–Meier analysis showed that 50% of treated rats lost 3% of their body weight by day 175 compared to day 157 in the sham-injected group. The hES-AS-treated rats maintained their body weight significantly longer (by about 30 days) than sham-injected rats (Fig. 5c, p = 0.007). A set of motor tests demonstrated the therapeutic effect of the hES-AS treatment. First the overall development of clinical symptoms, as evaluated by open field neurological scoring, was significantly delayed (Fig. 5d, p < 0.001). The decline of motor functionality, as measured by “time to fall” from a Rotarod, was markedly slowed down by hES-AS treatment, the animals maintaining normal motor activity for more than 1 month longer than the controls (Fig. 5e, p < 0.001). Likewise, the loss of forelimb muscle strength, as measured by the grip strength test, was significantly slowed down, just as the Rotarod performance (p < 0.001; data not shown). Other observations were that no tumors were observed in the animals post mortem. The safety, tumorigenicity and biodistribution phases were conducted in compliance with principles of good laboratory practice (GLP) over a period of up to 9 months. hES-AS, differentiated for 7 days, were injected intrathecally into the CSF of NSG mice through the CM with 0.4 × 106 cells/ mouse, or with a vehicle. Mice were sacrificed 4, 17 and 39 weeks post transplantation. No clinical signs were attributable to treatment during the monitoring periods. Cell-injected mice made similar body weight gain by 4, 17 and 39 weeks post dose to the vehicle control groups. In addition, there were no differences from the vehicle control at the hematological and blood chemistry investigations at 4, 17 and 39 weeks after dose administration (data not shown). Histopathological evaluation of the brain and spinal cord was performed to assess tumorigenicity. No teratoma or other tumors that could be related to the treatment were seen in the transplanted animals in any of tested time points. In order to evaluate the hES-AS distribution in the CNS, the sections were stained using an in-situ hybridization (ISH) technique with a human-specific Alu Y sequence. Cells positive for Alu Y sequences were present at all levels of the CNS in similar incidences between the three study time points. The incidence for the various levels range between 17% (distal areas from injection site) and 80% (at vicinity of the injection site) after 4 weeks, between 13% and 97% after 17 weeks and between 21% and 96% after 39 weeks (Fig. 6 and Additional file 4: Table S2). The cells were almost uniformly seen along the meninges, attached to the pia mater. To assess the biodistribution of hES-AS outside the CNS, the detection of human cells in mouse tissues was performed by quantitative real-time PCR (qPCR), targeting the specific sequence of the human Alu sequence. The detection was performed in nine organs including the spleen, kidney, testis/ovary, liver, heart, bone marrow of the femur, lungs, and cervical lymph nodes. The qPCR method was validated prior to the study and both the limit of detection (LOD) and the limit of quantification (LOQ) were set at one human cell (DNA equivalent) per 1 μg of mouse DNA. The PCR results showed no detection of human DNA above the LOD in any of the tested organs 4 and 17 weeks after transplantation. We also examined the astrocytic identity of hES-AS in vivo 2 months after their transplantation in the CSF of immunodeficient mice. Histological sections were stained for the general human cytoplasmic specific marker Stem121 and for Stem123 (human-specific GFAP antibody) in order to ascertain the presence of human cells. All Stem121-positive cells were positive for human GFAP, demonstrating that the transplanted hES-AS maintained their astrocytic identity in the CSF (Fig. 7). Further staining for the cell cycle marker Ki67 showed that 0.33 ± 0.15% of Stem121-positive cells in the CSF were also positive for Ki67, indicating for the very low proliferative capacity of hES-AS in vivo (Fig. 7g). This work describes the derivation of young astrocytes from human embryonic stem cells (hES-AS), which have therapeutic activity in vivo following intrathecal injection into the CSF of transgenic SODG93A rats and mice. In addition, we describe the results of a preclinical safety study in immunodeficient mice to assess the tumorigenicity potential and biodistribution of hES-AS in target and distal organs. To date, two FDA-approved drugs, riluzole and Radicava, were shown to modestly attenuate motor deterioration in ALS patients [52–55]. Still, many late-phase clinical trials failed to demonstrate a significant improvement in slowing down disease progression when using single-target drugs . ALS is a multifactorial disease and therapeutic approaches should take into account the multiplicity of mechanisms that underlie MN degeneration in this disease. Thus, a potential therapy that acts through multiple mechanisms of action to treat the broad pathological aspects of the disease is more likely to be effective. An example for the complexity of the disease is the involvement of astrocytes in the degeneration of MNs [5, 7, 8, 57]. Such noncell autonomous death of MNs caused by ALS-type astrocytes supports the rationale that transplantation of healthy human astrocytes into the CNS of ALS patients may compensate for the malfunctional astrocytes and rescue dying MNs (review in ). hES-AS exhibit multiple activities that were shown to be impaired in ALS-type astrocytes. Astrocytes from ALS transgenic mice express more iNOS/NOS2, leading to increased release of NO, which exacerbates oxidative stress leading to MN death . We show in our study that hES-AS protect in-vitro spinal cord MNs from oxidative stress produced by H2O2. In ALS patients, a decrease of the astroglial GLT-1 glutamate transporter is observed , leading to decreased glutamate uptake in the synaptic clefts of the spinal cord. Accumulation of excitatory glutamate makes MNs in ALS more susceptible to excitotoxicity . hES-AS express both glutamate transporters GLAST and GLT-1 and efficiently uptake glutamate, which is in part due to their GLT-1 expression, as shown by GLT-1 inhibitors. Another mechanism by which the diseased astrocytes lead to MN death is by a decrease in the secretion of neurotrophic factors. hES-AS produce and secrete the neurotrophic factors GDNF, BDNF, IGF-1 and VEGF in a comparable amount to that of endogenous astrocytes. The neurotropic property of hES-AS was demonstrated by cocultures of hES-AS with neurons and by hES-AS conditioned medium alone, indicating activity of soluble secreted factors. Secreted VEGF is likely to play an important role by protecting neurons in ALS, reducing excitotoxicity [28, 60], and its concentration is lower in the CSF of ALS patients . In addition, GDNF synergizes with VEGF to prolong survival in a murine ALS model . Intrathecal injection of CSF from sporadic ALS patients to neonatal rats induces selective degeneration of MNs  and downregulates the levels of both BDNF and IGF-1 in the spinal cord . Supplementation of BDNF reverses the neurodegenerative changes induced by ALS-CSF in MN cultures . The nature of the secreted factors was further investigated by a secretome analysis, clearly illustrating the pleiotropic activity of the cells. hES-AS secrete many factors having activities on neurons [65, 66–68] as well as several antiproteases and factors which could remodel the ECM (see Table 1). Among the more abundant factors found in the secretome analysis, several have been linked to ALS, thereby shedding new light on the possible mechanisms of action underlying the observed therapeutic effect in ALS models. One of the most abundant factors in the secretome is Osteopontin (OPN/SSP1), which in the mutant SOD1 model of ALS is found to be associated with MNs that are more resistant to degeneration early in the disease, but low in the MNs more vulnerable to degeneration in ALS . Conversely, the vulnerable MNs are high in matrix metalloproteinase MMP-9 (MMP9high /OPNlow), whereas MMP-9 is low and OPN is high in the ALS-resistant MNs [69, 70]. Exogenous addition of OPN has neurogenic effects, stimulating regeneration of motor axons  and protecting neurons after ischemia in vitro and in vivo . Although MMP9 was not detected in the secretome of our astrocyte cultures, inhibitors of MMP9 and other matrix metalloproteases were abundantly secreted, particularly the tissue inhibitors of metalloproteases TIMP-1 and TIMP-2, which play a major role in preventing degradation of ECM components by MMPs or regulating ECM remodeling (review in ). Another chemokine found in the secretome is MIF, which has the capacity to save primary MNs from the degeneration caused by the ALS mutant SOD1 form, probably by acting as a chaperone . Also secreted is Clusterin, another chaperone, promoting axon regeneration, as observed on peripheral sensory neurons , and increasing neuron survival . Midkine secreted by astrocytes is a known neurotrophic factor promoting neurite outgrowth and neuron survival (review in ). The multiple nature of the factors secreted by the hES-AS supports a mode of action much more diversified than merely through the classical neurotrophic factors. The efficacy of hES-AS to delay disease onset and to ameliorate disease progression was evaluated in transgenic high copy number SOD1G93A mouse and rat models, which recapitulate many of the clinical symptoms of the ALS disease in humans [18, 51, 77]. Intrathecal injection of hES-AS significantly delayed the onset of the disease and slowed down the deterioration of motor function. These effects were more pronounced when the cells were administered twice (3–4 weeks apart) than with a single injection. Intrathecal injection into the CSF is in line with the proposed mode of action, in which the healthy astrocytes would work at a distance to modify the environment of brain and spinal cord MNs. Indeed, the CSF composition shows several changes in the course of ALS [78, 79], including an increase in oxidative stress markers, an increase in glutamate in at least 40% of patients and variations of VEGF concentration correlating with the length of survival , and other changes including OPN increase . Moreover, the fact that inoculation of CSF from ALS patients to animals is neurotoxic  demonstrates that materials injected into the CSF can affect the parenchyma. A major safety concern associated with pluripotent stem cell-based therapies is the presence of residual undifferentiated stem cells that might continue to divide without control or develop teratoma after their transplantation in the body [82, 83]. We minimize the possibility of teratoma formation by assuring a complete differentiation of hESCs into committed astrocytes with a normal diploid karyotype and minimal proliferation capacity. Teratoma formation from undifferentiated hESCs depends on several factors, among them the site of implantation and number of transplanted cells. Several studies reported that undifferentiated hESCs develop teratomas within 6 weeks after transplantation in immunodeficient mice [47, 82, 84, 85]. We previously reported that injection of undifferentiated hESCs intrathecally into immunodeficient mice results in teratoma formation within 5–7 weeks after injection . In our current study, we evaluated the formation of teratomas, or any other tumor, by hES-AS up to 39 weeks after their intrathecal injection, long enough to allow development of teratomas. Histology evaluation showed the cells survived in the CSF for the entire duration of the study, attached to the pia mater along the neuroaxis, The cells uniformly expressed astrocytic markers with very rare coexpression of the cell cycle marker Ki67. Importantly, hES-AS did not develop teratoma or any other tumors in any of the treated mice. In line with these results, Priest et al. also reported the absence of teratomas in the CNS following intraspinal injection of oligodendrocyte progenitors derived from hESCs into the spinal cord of immunodeficient rats. To access the CNS, we chose the CSF as the injection site for hES-AS. The circulating CSF helps to distribute the injected cells throughout the subarachnoid space. In addition, injection into the CSF by LP is a common low-risk medical practice already demonstrated in several clinical trials with cell-based therapies [88–91]. 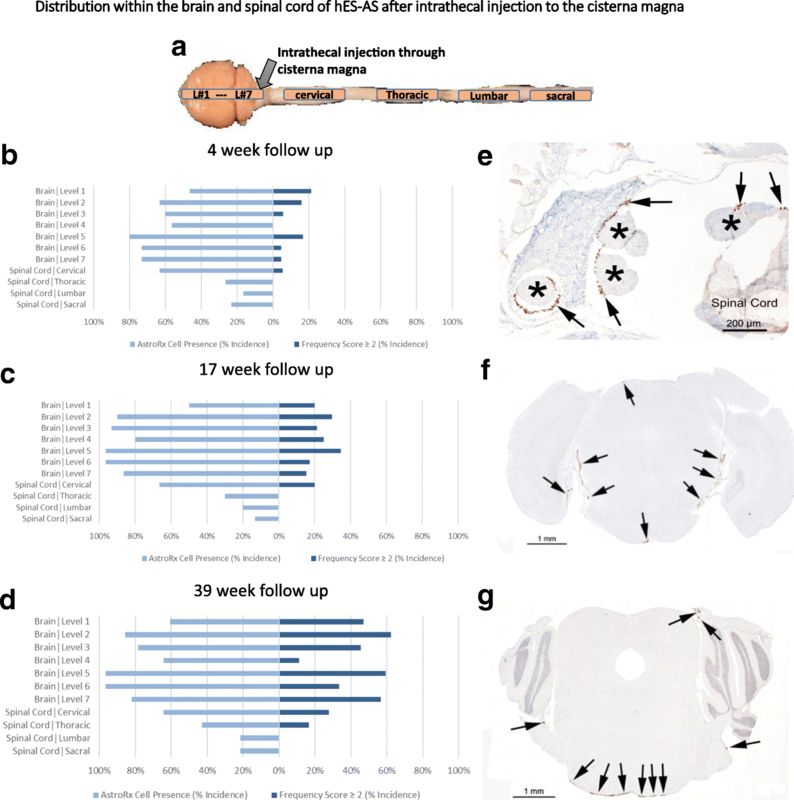 A biodistribution evaluation of hES-AS in the CNS was performed by in-situ hybridization of the Alu Y gene at 4, 17 or 39 weeks following a single intrathecal injection of cells into immunodeficient mice. The analysis revealed the presence of hES-AS cells in the subarachnoid space throughout the entire CNS. Cell numbers were maintained stable over time, supporting that the cells remain quiescent in the CSF. The effective biodistribution of hES-AS along the entire CSF supports the clinical benefits we observed in SOD1G93A models. We found an attenuation in motor activity loss in both lower and upper limbs and the tail, indicating that the cells exert their activity on multiple regions of the CNS. The possible migration of cells to distant organs was evaluated by qPCR for amplification of the Alu Y genomic sequence in nine organs. hES-AS were not found in any distant organ above the detection limit of the method (1 cell) at 4 and 17 weeks after their intrathecal injection. This confined distribution of the cells to the CNS minimizes any possible risk of presence of ectopic glial tissue in nontarget organs outside the CNS. Large quantities of human astrocytes would be needed for the treatment of ALS patients worldwide. As shown here, clinical-grade human ESCs provide a robust and controlled source of cells for mass production of glial progenitors that can give rise to functional astrocytes. To comply with GMP standards, we adjusted our previous protocol, originally aimed to produce both astrocytes and oligodendrocytes , to include only GMP-grade materials. Under this protocol, large amounts of astrocyte progenitor cells (APCs) are obtained, which can be frozen in liquid nitrogen for long-term storage  as master and working cell banks for future expansion. Upon thawing of the APC vial, the differentiation into hES-AS is completed within 7 days of culturing. In terms of yield, using our protocol we can produce a total of 2 × 1013 hES-AS from a single batch of hESCs. Hence, the process described here is suitable for mass production of clinical-grade hES-AS per batch, which can potentially treat thousands of patients [92, 93]. In recent years, clinical trials of cell therapy in ALS have mainly used autologous transplantation of mesenchymal stem or stromal cells (MSCs) [89, 94], in which cells are taken from the patients and after in-vitro culture are returned to the same patient. While giving promising clinical efficacy, these autologous transplantations have limitations and it would be advantageous to develop allogeneic cells as a shelf-product that would provide a treatment for all ALS patients. Given that intrathecal administration is effective (as seen with the MSCs), it would be easier than injections in the spinal cord anterior horn, which requires major surgery as done in recent ALS clinical trials with neural stem cells taken from human organ donors [95, 96]. 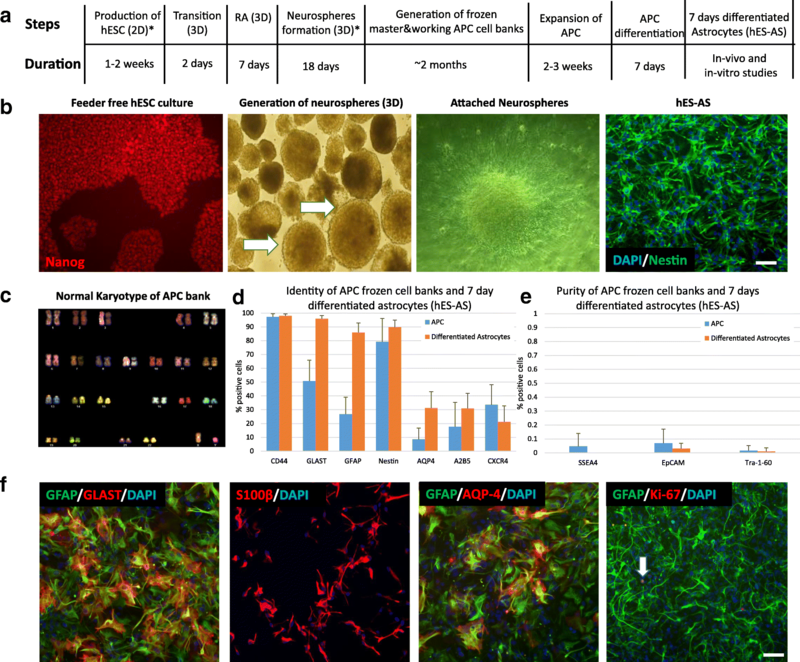 Future clinical trials could use human pluripotent stem cell cultures for mass production of neural cells, either from human iPSCs [97, 98] or from human ES cell lines as described here. Here we describe the derivation of a highly enriched population of functional, clinical-grade, human astrocytes (hES-AS) from embryonic stem cells. The hES-AS were shown to protect MNs by multiple mechanisms, similarly to normal astrocytes, including clearance of glutamate, secretion of multiple NTFs, neutralization of ROS and promotion of neural outgrowth. Intrathecal injection of hES-AS to rodent models of ALS delays disease onset, slows down disease progression and extends life expectancy. 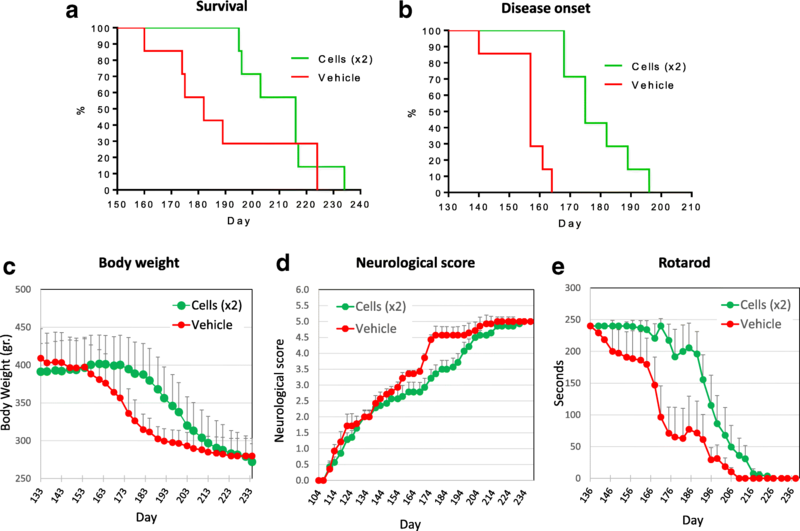 A 9-month safety study conducted in an immunodeficient NSG animal model, under GLP conditions, showed that intrathecal transplantation of hES-AS cells to the cerebrospinal fluid (CSF) is safe. Thus, these findings demonstrate the feasibility, safety and potential efficacy of intrathecal injections of hES-AS for the treatment of ALS. The safety and efficacy of hES-AS treatment in ALS patients will be tested in a phase I/IIa clinical trial (ClinicalTrials.gov identifier: NCT03482050). Two clinical-grade hESC lines, were used: NCL14, licensed from the University of Newcastle; and HADC100, obtained from the Hadassah Medical Organization (HMO), Jerusalem (Prof. Benjamin Reubinoff). Master cell banks (MCB) and working cell banks (WCB) of these hESCs were created at Kadimastem Ltd. The undifferentiated state of the hESCs was routinely assessed by flow cytometry analysis of the surface markers SSEA-4, EpCAM and TRA-1-60, and by immunofluorescence staining for the transcription factors NANOG and OCT4. Both lines were propagated in undifferentiated state on a HFF feeder layer (25,000 cells/cm2) by passaging every 6–7 days using collagenase in order to detach the whole hESC colonies from the feeder cell layers. The colonies were mechanically broken and seeded in a ratio of 1:3–6. The hESCs were grown in ES1 media composed of KO-DMEM, 14% (v/v) KO serum replacement, 2 mM glutamine, 1× MEM nonessential amino acids, 0.1 mM β-mercaptoethanol and 25 U/ml penicillin, 25 μg/ml streptomycin (all from Life Technologies) and 8 ng/ml bFGF (R&D). Important to note is that for generation of clinical-grade hESCs, the cells were adapted to feeder free conditions and the media composition was changed to Essential 8™ (E8) medium (Thermo Fischer Scientific). Formation of neurospheres (NS) was done in suspension (3D) cultures. In brief, the harvested hESC colonies were transferred into 100-mm ultralow attachment culture plates (Corning) containing ITTSPP/B27 medium. ITTSPP/B27 is a mixture of DMEM/F12 containing 1% B27 supplement, 1% Glutamax, 1.5% Hepes at pH 7.4 (all from Thermo Scientific), 1% penicillin/streptomycin/amphotericin solution (Biological Industries), 25 μg/ml human insulin (ActRapid; Novo Nordisk), 50 μg/ml human Apo-transferrin (Athens), 6.3 ng/ml progesterone, 10 μg/ml putrescine, 50 ng/ml sodium selenite and 40 ng/ml triiodothyronine (T3) (all from Sigma). ITTSPP/B27 was supplemented with 20 ng/ml r-human EGF (R&D Systems). After 2 days, the medium was switched to ITTSPP/B27 supplemented with 20 ng/ml EGF and 10 μM ATRA (Sigma). The culture was continued in suspension in the nonadherent plates for 7 days with daily replacement of the medium (stage 2; Fig. 1). During the last step, which allows for NS ripening, the culture was continued in ITTSPP/B27 medium supplemented with 20 ng/ml EGF for 18 days. Medium was replaced every other day (stage 3; Fig. 1). For APC expansion, round yellow NS were manually selected using a stereoscopic microscope and transferred into six-well plates coated with Matrigel or GMP-compliant laminin 521 (from Biolamina) in ITTSPP/B27 supplemented with 20 ng/ml EGF. Medium was replaced every other day for 7–10 days (passage 0). In order to produce a monolayer, the spheres were dissociated with TryplE (Thermo Scientific) and reseeded on ECM (passage 1) in N2/B27 medium consisting of DMEM/F12 with 0.5% (v/v) N2 supplement, 1% (v/v) B27 supplement, 1% Glutamax and 1.5% Hepes at pH 7.4 (all from Thermo Scientific). The growth factors EGF and bFGF (R&D Systems) were added at 10 ng/ml each. The monolayer cells were further passaged weekly until a sufficient number of cells was generated. Cells were then frozen in liquid nitrogen and stored as banks of APCs. Thawed APCs were further expanded as described earlier for 2–3 weeks. In order to differentiate the APCs toward astrocytes, EGF and bFGF were removed from the media, 50 μg/ml ascorbic acid (Sigma) was added and the culture was continued for 7 or 28 days. Cells were fixed with 4% paraformaldehyde (PFA), washed with PBS and kept at 4 °C before staining. Permeabilization was done by 0.5% Triton X-100 in Blocking solution (5% BSA; Sigma) and 3% horse serum (w/v in PBS; Biological Industries). Incubation in the same blocking solution was done for 1 h at RT. Primary antibodies, diluted in blocking solution, were as follows: anti-Nanog, anti-Nestin (1:500; BD Pharmingen), anti-GFAP-cy3 (mouse monoclonal antibody (Mc), 1:500; Sigma), anti-GLAST (rabbit Mc, 1:100; Miltenibiotec), anti-S100 (rabbit polyclonal antibody, 1:100; DAKO), anti-AQP-4 (rabbit, 1:2000; Mc Abcam) and anti-Ki67 (rabbit, 1:50; Mc Cell Marque). After overnight incubation at 4 °C, secondary antibody (1:200; Jackson Immuno Research) was added for 1 h at RT, followed by the nuclear fluorescent dye DAPI (0.05 μg/ml; Sigma). Pictures were taken using Arrayscan VTI (Thermo Scientific, Cellomics). Brain and spinal cord tissues were trimmed, decalcified and embedded in paraffin, sectioned at approximately 5 μm thickness and stained with hematoxylin and eosin (H&E). For immune-cytofluorescence assays, tissues were deparaffinized using the following washes: xylene (Sigma), two washes × 5 min; 100% ethanol, two washes × 5 min; 95% ethanol, one wash × 5 min; 70% ethanol, one wash × 5 min; and cold tap water, two washes × 5 min. Heat-induced epitope retrieval was performed by boiling the sections in a domestic microwave, twice for 10 min, using 100× H-3300 citrate-based solution (Vector Laboratories). Permeabilization was done by 0.5% Triton X-100 in blocking solution as described earlier, and incubation continued in the same blocking solution for 1 h at RT. Primary mouse Mc antibody Stem123 or Stem121 (1:500; Stem Cells) were added overnight and kept at 4 °C. Secondary antibody goat anti mouse Cy2 or Cy3 (1:200; Jackson Immuno Research) were added for 1 h at RT, followed by the nuclear fluorescent dye DAPI (0.05 μg/ml; Sigma). The test was performed using spectral karyotyping analysis (SKY) on cells from two APC banks (passages 11 and 12). The analysis was performed by the Stem Cell Core and Advanced Cell Technologies Unit, Department of Life Sciences Core Facilities, Weizmann Institute of Science. Cells were analyzed by flow cytometry for identity and purity markers using the following antibodies: anti-A2B5 (1:20; Miltenibiotec), anti-GLAST (1:20; Miltenibiotec), anti-CD44 (1:20; BD Pharmingen), anti-CXCR4 (1:20; Biolegend), anti-TRA-1-60 (1:50; Biolegend), anti-EPCAM (1:50; Biolegend), anti-SSEA4 (1:50; Biolegend), anti-GFAP (1:2000; Sigma), Nestin (1:500; BD Pharmingen) and anti-AQP-4 (1:2000; Abcam). The Flow Cytometer FACS Canto II (BD) was operated with FACSDIVA software (BD). At least 10,000 events were collected per sample. 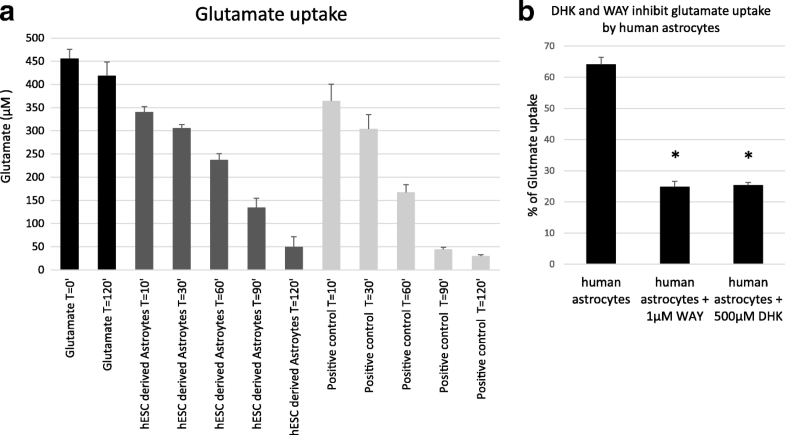 Glutamate uptake capability of the cells was measured in 28-day differentiated hESC-derived astrocytes. Glutamic acid (0.5 mM; Sigma) in Hanks’ Balanced Salt Solution (Gibco) was added to 1 × 106 cells/ml. After 0, 10, 30, 60 and 120 min, the solution was aspirated and kept at 4 °C until further testing. Human astrocytes derived from the spinal cord (from Thermo Scientific) served as positive control, while 0.5 mM glutamic acid kept at 37 °C for 120 min served as negative control. In addition, 0.5 mM glutamic acid kept at 4 °C for 120 min served as time 0 concentration control. The EnzyChrom™ Glutamate Assay Kit (BioAssay Systems) was used to measure the concentration of glutamate in the collected samples according to the manufacturer’s protocol and recommendations. The optical density was read at 565 nm using the iMark Microplate reader (Bio Rad). Dihydrokainic acid (DHK, 500 μM; Sigma) or 1 μM WAY-213,613 (Sigma) were used as inhibitors of GLT-1. In order to promote astrocyte differentiation, APCs were deprived from growth factors (bFGF and EGF) and vitamin C was added for 7 days and 28 days. Conditioned media were collected after 48 h from each experimental well. The number of cells for each well was counted (at least two replicas per each cell type) and secretome analysis was performed by multiplex ELISA using the human quantibody kiloplex Array (Raybiotech). The values obtained in secretome analysis were normalized to 1 × 106 cells/ml. Transgenic hSOD1G93A mice aged 8–9 weeks of mixed gender (B6SJL-Tg(SOD1*G93A)1Gur/J) were purchased from The Jackson Laboratory (Bar Harbor, ME, USA; https://www.jax.org/). Transgenic hSOD1G93A rats aged 5–6 weeks of mixed gender (NTac:SD-Tg(SOD1G93A)L26H) were purchased from Taconic Biosciences Inc. (Hudson, NY, USA; http://www.taconic.com). All animal care and surgical procedures described here were carried out according to protocols approved by the Israeli National Committee for Animal Care. The animals were kept in a certified animal facility in IVC cages with a light cycle of 12 h and at temperature of 22 ± 2 °C. Rodent diet and drinking water were provided ad libitum. Mice were anesthetized with an i.p. injection of ketamine/xylazine (K4138; Sigma) and then mounted on a stereotaxic frame. The head was then bent, resulting in nape distention. A midline skin incision was made at the nape area to expose the sagittal suture of the cranium and midline of the nape. Under a dissection microscope, the subcutaneous tissue and muscles were separated by blunt dissection with forceps to expose the cleft between the occipital bone and the atlas vertebra. The muscles were held apart to expose the dura mater which was carefully penetrated using a 29G-gauge 45° beveled needle (Hamilton, Reno, NV, USA) connected to a 10-μl Hamilton syringe preloaded with 10 μl of cell suspension or vehicle (DMEM/F12 medium). Then 2 × 106 hES-AS (APCs differentiated for 7 days) were injected once on day 67 ± 2 (CellsX1 group, n = 14 mice) or twice on day 67 ± 2 and on day 97 ± 2 at interval of 30 days (CellsX2 group, n = 13), or injected with DMEM F12 (Sham group, n = 10) into the CSF through the CM. The syringe was held in position for 3 min before being gradually pulled away to avoid liquid outflow along the needle tract. The skin cut was secured with stainless steel surgical clips and wiped with 70% ethanol. The rats were anesthetized with ketamine/xylazine. The lumbar region was shaved, sterilized with iodine and the intervertebral spaces widened by placing the animal on a 15-ml conical plastic tube. The injections were performed by inserting a 29-gauge 45° beveled needle (Hamilton) connected to a 10-μl Hamilton syringe into the tissues between the dorsal aspects of L5 and L6. Correct subarachnoid positioning of the tip of the needle was verified by a tail flick test. A volume of 10 μl containing 3 × 106 APCs was injected twice on day 50 ± 2 and on day 70 ± 2 (n = 7), or vehicle (DMEM/12 medium, n = 7) was injected. The syringe was held in position for 30 s before being progressively pulled away. Immunosuppression was used only in the transplantation experiment in SOD1G93A mice. In this experiment, Cyclosporin A was given daily by intraperitoneal injection, at a dose of 10 mg/kg, starting 3 days prior to the treatment and lasting all throughout the duration of the experiment. CellCept was administered orally twice a day at a dose of 15 mg/kg (total daily dose was 30 mg/kg). Dosing started 3 days prior to the treatment and lasted for a total of 10 consecutive days. Cohort 3, which was given the treatment twice, started receiving CellCept 3 days prior to each treatment injection for 10 consecutive days. Measurement of body weight and all motor tests took place 7–10 days prior to cell transplantation and routinely afterward. Motor function was tested using an acceleration Rotarod device (Rotarod 7650; Ugo Basile, Comerio, Italy) for the duration of 180 s. The time it took each mouse to fall from the rod was recorded. Animals were trained for 1 week prior to conducting the test. Forelimb muscle grip strength was determined using a Grip Strength Meter 47,200 (UGO Basile). Grip strength testing was performed by allowing the animals to grasp a thin bar attached to the force gauge. This is done by pulling the animal away from the gauge until the mice forelimbs released the bar. The procedure provides a value of the force of maximal grip strength. The force measurements were recorded in three separate trials, and the averages were used in the statistical analysis. Neurological scoring was done according to neurological score on a scale from 0 to 5 . Kaplan–Meier analysis of the SOD1G93A mice and rats was conducted using the statistical software Sigmastat (SAS Software) to analyze survival, disease onset and duration data. Weight, time to fall from the Rotarod, neurological score and grip strength results were analyzed via repeated-measures ANOVA. All data are presented as mean ± SEM, and significance level was set at p ≤ 0.05. Statistical analysis was performed by MediStat Ltd, Israel. The mouse was mounted on a stereotaxic frame. A midline skin incision was made at the nape area to expose the sagittal suture of the cranium and midline of the nape. The head was then bent, resulting in nape distention. Under a dissection microscope, the subcutaneous tissue and muscles were separated by blunt dissection with forceps to expose the cleft between the occipital bone and the atlas vertebra. The muscles were held apart to expose the dura mater which was penetrated using a 29G needle connected to a Hamilton syringe, preloaded with 10 μl of 0.4 × 106 hES-AS. The cells were injected within 30 s into the CSF space. The needle was held for about 30 s after injection and then withdrawn. The skin cut was secured with stainless steel surgical clips and wiped with polydine solution. A comment to this article is available online at https://doi.org/10.1186/s13287-018-1006-y. The authors would like to thank Science in Action and Envigo-IL animal facilities for conducting animal studies. This work was supported by the Israel Innovation Authority National Natural (grant No. 59652). RM, IM, SSG, CJ and HA, JI-E conceived and designed the studies. TA, LC, GA, KPL, LN, SYI, SJL, ZR, ZA and EV performed the experiments. KG was responsible for quality assurance. IM and SSG analyzed the data. IM, SSG, RM and CJ wrote the manuscript. SSG and IM interpreted the data and reviewed the manuscript. All authors read and approved the final manuscript. This study was performed following an application-form review by the National Council for Animal Experimentation and after receiving approval (No. IL-16-09-279) that the study complies with the rules and regulations set forth.